The 2016 Summer Olympics (Portuguese: Jogos Olímpicos de Verão de 2016),[a] officially known as the Games of the XXXI Olympiad and commonly known as Rio 2016, was an international multi-sport event that was held from 5 to 21 August 2016 in Rio de Janeiro, Brazil, with preliminary events in some sports beginning on 3 August. These were the first Olympic Games ever to be held in South America and the second to be held in a developing country, after the 1968 games in Mexico City. These were the first Summer Olympic Games to take place under the International Olympic Committee (IOC) presidency of Thomas Bach. The host city Rio de Janeiro was announced at the 121st IOC Session in Copenhagen, Denmark, on 2 October 2009. Rio became the first South American city ever to host the Olympic Games. These were the first games to be held in a Portuguese-speaking country, the first summer edition to be held entirely in the host country's winter season, the first since 1968 to be held in Latin America, and the first since 2000 to be held in the Southern Hemisphere. The lead-up to these Games was marked by controversies, including the Brazil's political and economic crisis; the Zika virus epidemic and the significant pollution in the Guanabara Bay; and a doping scandal involving Russia, which affected the participation of its athletes in the Games. However, nobody competing in or attending the Olympics contracted the Zika virus and the Games took place normally, without any major incident. The United States topped the medal table, winning the most gold and overall medals, 46 and 121, as well as its 1,000th Summer Olympic gold medal overall. Great Britain finished second and became the second country of modern Olympics history to increase its tally of medals in the subsequent games after being the host nation. China finished third. Host country Brazil won seven gold medals, its most at any single Summer Olympics, finishing in thirteenth place. Bahrain, Fiji, Jordan, Kosovo, Puerto Rico, Singapore, Tajikistan, Ivory Coast and Vietnam each won their first gold medals, as did the group of Independent Olympic Athletes (from Kuwait). The process for the 2016 Olympic Games was officially launched on 16 May 2007. The first step for each city was to submit an initial application to the International Olympic Committee by 13 September 2007, confirming their intention to bid. Completed official bid files, containing answers to a 25-question IOC form, were to be submitted by each 14 January 2008. 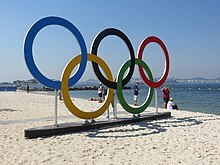 Four candidate cities were chosen for the shortlist on 4 June 2008: Chicago, Madrid, Rio de Janeiro and Tokyo, which hosted the 1964 Summer Olympics and will host again in 2020. The IOC did not promote Doha to the candidature phase, despite scoring higher than selected candidate city Rio de Janeiro, because of their intent of hosting the Olympics in October, outside of the IOC's sporting calendar. Prague and Baku also failed to make the cut. Each event was held in one of four geographically segregated Olympic clusters: Barra, Copacabana, Deodoro, and Maracanã. The same was done for the 2007 Pan American Games. Several of the venues were located at the Barra Cluster Olympic Park. Athletes could access their venues in shorter than ten minutes and about 75 percent could do so in less than 25 minutes. Of the 34 competition locations, eight of them underwent permanent works, seven were limited, and nine were perpetual legacy venues. The nine venues within the Olympic Park were: Carioca Arena 1: basketball (capacity: 16,000); Carioca Arena 2: wrestling, judo (capacity: 10,000); Carioca Arena 3: fencing, taekwondo (capacity: 10,000); Future Arena: handball (capacity: 12,000); Maria Lenk Aquatics Centre: diving, synchronised swimming, water polo (capacity: 5,000); Olympic Aquatics Stadium: swimming, water polo play-offs (capacity: 15,000); Olympic Tennis Centre: tennis (capacity: 10,000 Main Court); Rio Olympic Arena: gymnastics (capacity: 12,000); and Rio Olympic Velodrome: track cycling (capacity: 5,000). Rio's historical downtown underwent an urban waterfront revitalization project called Porto Maravilha. It covers 5 km2 (1.9 sq mi) in area. The project aimed to redevelop the port area, increasing the city center's attractiveness and enhancing Rio's competitive position in the global economy. The urban renovation involves: 700 km (430 mi) of public networks for water supply, sanitation, drainage, electricity, gas and telecom; 4 km (2.5 mi) of tunnels; 70 km (43 mi) of roads; 650 km2 (250 sq mi) of sidewalks; 17 km (11 mi) of bike path; 15,000 trees; three sanitation treatment plants. As part of this renovation, a new tram was built from the Santos Dumont Airport to Rodoviária Novo Rio. It was due to open in April 2016. In May 2017, an Associated Press article disclosed that more than 100 athletes from around the world reported that their medals had damage, including black spots, flaking, or surface degrading. Rio officials offered to replace any defective medals and found problems with 6 to 7 percent of all awarded medals. The Olympic flame was lit at the temple of Hera in Olympia on 21 April 2016, the traditional start of the Greek phase of the torch relay. On 27 April the flame was handed over to the Brazilian organisers at a ceremony at the Panathenaic Stadium in Athens. A brief stop was made in Switzerland to visit the IOC headquarters and the Olympic Museum in Lausanne as well as the United Nations Office at Geneva. As an aspect of its bid, Rio's organizing committee planned to focus on sustainability and environmental protection as a theme of these Games, going on to dub them a "Green Games for a Blue Planet". As legacy projects, organisers intended to introduce a wider array of public transport options, upgrade the infrastructure of the favelas to provide improved transport and access to utilities, upgrade Rio's sewer system in order to remediate the level of pollution in the Guanabara Bay. and plant 24 million seedlings to offset the expected carbon emissions of the Games. However, some of these projects were met with delays or faced with economic shortfalls, which led some critics to believe that Rio would not be able to accomplish them. Future Arena, a temporary venue designed to be reconstructed into schools. The focus on environmental protection also influenced the implementation of certain Olympic protocols: the Olympic cauldron was designed to be smaller than previous iterations in order to reduce emissions, and used a kinetic sculpture to enhance its appearance in lieu of a larger body of flames. The bronze and silver medals, as well as ribbons on all medals, incorporate recycled materials. The athletes were not presented with flowers during medal ceremonies, as had been traditionally done at prior Olympics (although flowers were still used as part of the staging of medal presentations). Organisers considered the practice to be wasteful since they were often thrown away, and "would struggle to survive in the tropical Brazilian climate" if kept. The podiums were also designed so that their materials could be recycled to make furniture. The Future Arena, host of handball competitions, was designed as a modular temporary venue whose components can be reconstructed to build schools. However, as of November 2017, the arena is still standing because of lack of money to dismantle it and no allocation of funds to do so in the 2018 budget. The opening ceremony took place at Maracana Stadium on 5 August 2016, and was directed by Fernando Meirelles, Daniela Thomas and Andrucha Waddington. The ceremony highlighted aspects of Brazilian history and culture, and featured a segment narrated by Fernanda Montenegro and Judi Dench with an appeal to environmental conservation and preventing global warming. The ceremony also featured the inaugural presentation of the Olympic Laurel, an honour bestowed by the IOC to those that have made "significant achievements in education, culture, development and peace through sport", to Kipchoge "Kip" Keino. The Games were officially opened by Acting President of Brazil Michel Temer. The Olympic cauldron was lit by Vanderlei Cordeiro de Lima, the men's marathon bronze medallist at the 2004 Summer Olympics who was also awarded the Pierre de Coubertin medal for sportsmanship by the IOC after being attacked by a spectator and losing his lead. The cauldron was originally expected to be lit by Brazilian footballer Pelé, but he declined to participate due to health problems. 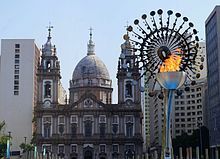 Following the opening ceremony, a public cauldron was lit in front of the Candelária Church by Jorge Gomes, a 14-year-old Brazilian athlete who had escaped from poverty to train as a runner. In April 2008, the IOC began accepting applications for two new sports to be introduced to the Olympic programme, which included baseball and softball (which were dropped in 2005), karate, squash, golf, roller sports, and rugby union all applied to be included. Formal presentations were held for the IOC executive board in June 2009. In August, the executive board initially gave its approval to rugby sevens—a seven-player version of rugby union—by a majority vote, thus removing baseball, roller sports, and squash from contention; leaving golf, karate, and rugby sevens. A final vote was held on 9 October 2009, the final day of the 121st IOC Session. A new system was in place at this session; a sport now needed only a simple majority from the full IOC committee for approval rather than the two-thirds majority previously required. The International Sailing Federation announced in May 2012 that windsurfing would be replaced at the 2016 Olympics by kitesurfing, but this decision was reversed in November. The 121st IOC Session decided to add Rugby Sevens and Golf to the Rio 2016 program. The tally for rugby was 81 in favor, with 8 against, and golf was approved 63–26. Neither sport is new to the Olympics — rugby was last featured at the Olympics in 1924, and golf in 1904. As host nation, Brazil has received automatic entry for some sports including in all cycling disciplines and six places for weightlifting events. The 2016 Summer Olympics were the first games in which Kosovo and South Sudan were eligible to participate. Bulgarian and Russian weightlifters were banned from Rio Olympics for numerous anti-doping violations. Due to the European migrant crisis and other reasons, the IOC allowed athletes to compete as Independent Olympians under the Olympic Flag. In the previous Summer Olympic Games, refugees were ineligible to compete because of their inability to represent their home NOCs. On 2 March 2016, the IOC finalised plans for a specific Refugee Olympic Team (ROT); out of 43 refugee athletes deemed potentially eligible, 10 were chosen to form the team. On 24 July 2016, the IOC rejected the IAAF and WADA's recommendations to allow athletes to compete neutrally, stating that the Olympic Charter "does not foresee such 'neutral athletes'" and that it was up to each country's National Olympic Committee to decide which athletes would be competing. As a result, Russian athletes competed under the Russian flag, although they would compete under a neutral flag in the 2018 Winter Olympics following several developments with regard to the doping ivestigation. The medals designed for the Olympics. They were designed to be environmentally friendly from recycled materials. The public cauldron, located outside the Candelária Church. A number of events, most notably in aquatics, beach volleyball, and track and field, were scheduled with sessions and matches occurring as late as 10:00 p.m. to midnight BRT. These scheduling practices were influenced primarily by United States broadcast rightsholder NBC (due to the substantial fees NBC has paid for rights to the Olympics, the IOC has allowed NBC to have influence on event scheduling to maximize U.S. television ratings when possible; NBC agreed to a $7.75 billion contract extension on May 7, 2014, to air the Olympics through the 2032 games, is also one of the major sources of revenue for the IOC),  as well as the main Brazilian rightsholder Rede Globo. 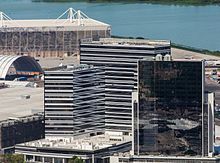 As Brasília time is only one hour ahead of the U.S. Eastern Time Zone, certain marquee events were scheduled to occur during U.S. primetime hours (traditionally 8:00 to 11:00 p.m. ET, 9:00 p.m. to midnight BRT) allowing them to be broadcast live on the east coast as opposed to being delayed. This practice was also to the benefit of Globo; a Brazilian television critic noted that Globo very rarely pre-empts its primetime telenovelas, which are among the highest-rated programs on Brazilian television. Globo artistic developer Monica Albuquerque did not rule out doing so during special circumstances, however. The closing ceremony of the 2016 Summer Olympics was held on 21 August 2016 from 20:00 to 22:50 BRT at the Maracanã Stadium. As per traditional Olympic protocol, the ceremony featured cultural presentations from both the current (Brazil) and following (Japan) host countries, as well as closing remarks by IOC president Thomas Bach and the leader of the Games' organizing committee Carlos Arthur Nuzman, the official handover of the Olympic flag from Rio de Janeiro mayor Eduardo Paes to Tokyo governor Yuriko Koike, whose city will host the 2020 Summer Olympics, and the extinguishing of the Olympic flame. The creative director for the ceremony was Rosa Magalhães. Amid heavy rainfall, the ceremony began with interpretive dancers representing various landmarks in the host city. Martinho da Vila then performed a rendition of the classic song "Carinhoso [pt]" by Pixinguinha. In another segment, introducing the athletes, pop singer Roberta Sá channeled Carmen Miranda, the fruit-headdress-wearing, midcentury Hollywood diva who endures as a beloved camp figure. The Parade of Flags followed shortly after a choir of 27 children, representing the states of Brazil, sang the Brazilian national anthem. The Oxford Olympics Study 2016 estimated the out-turn cost of the Rio 2016 Summer Olympics at US$4.6 billion in 2015-dollars. This figure included sports-related costs, that is, (i) operational costs incurred by the organizing committee for the purpose of staging the Games, of which the largest components were technology, transportation, workforce, and administration costs, while other operational costs included security, catering, ceremonies, and medical services, and (ii) direct capital costs incurred by the host city and country or private investors to build the competition venues, the Olympic village, international broadcast center, and media and press center, which were required to host the Games. Indirect capital costs were not included, such as for road, rail, or airport infrastructure, or for hotel upgrades or other business investment incurred in preparation for the Games but not directly related to staging the Games. The Rio Olympics' cost of US$4.6 billion compares with costs of US$40–44 billion for Beijing 2008 and US$51 billion for Sochi 2014, the two most expensive Olympics in history. The average cost of the Summer Games since 1960 is US$5.2 billion. Olympic rings displayed in Rio de Janeiro. Following the conclusion of the games the International Olympic Committee in November 2017 announced the winners of the Golden rings in six categories for the best broadcast coverage of the games. The Best Olympic Sports Production was awarded to Beach Volleyball. It was producted by Geoff Johnson. and directed by Greg Breakell and Gary Milkis. The production for the cycling road race and Sailing came second and third. The next category was best Olympic feature. TV Globo's feature entitle "Esporte Espetacular" finished third and China Central Television's feature - A Sequel of Love came second. The winner was NBC Olympics for their feature titled The Most Beautiful Thing. The third category was The Best Athlete Profile. RTBF Radio Télévision de la Communauté Française de Belgique for their profile of Nafi Thiam collected the third place prize. TV Globo went one better than the previous category coming second with their profile of Izaquias Queiroz. The winner of the category again was NBC this time for their piece on Wayde van Niekerk. The Best On-Air Promotion was announced next with the BBC Sport winning with NBC this time coming second and Bulgarian National Television finished third. The Best Olympic Digital Service went to NBC with ZDF-German TV and SporTV/Globosat picking up the second and third places. The Best Olympic Programme was awarded to SporTV/Globosat while TV Globo and BBC Sport completed the podium. The official mascots of the 2016 Summer Olympics and Paralympics were unveiled on 24 November 2014. They were created by Sao Paulo-based animation company Birdo. The Olympic mascot Vinicius, named after musician Vinicius de Moraes, represents Brazilian wildlife and carries design traits of cats, monkeys, and birds. According to their fictional backgrounds, the mascots "were both born from the joy of Brazilians after it was announced that Rio would host the Games." Brand director Beth Lula stated that the mascots were intended to reflect the diversity of Brazil's culture and people. The names of the mascots were determined by a public vote whose results were announced on 14 December 2014; the names, which reference the co-writers of the song "The Girl from Ipanema", won over two other sets of names, tallying 44 percent of 323,327 votes. At the Olympic wrestling events, coaches were given plush dolls of Vinicius to throw into the ring when they wished to challenge a referee's call. The logo has been noted as evoking Henri Matisse's painting Dance. There were also allegations by the Colorado-based Telluride Foundation that the logo had been plagiarised from its own. While also consisting of several figures linked in motion, the Telluride Foundation logo contains four figures. This is not the first time that the foundation had alleged plagiarism of its logo by a Brazilian event; in 2004, the linked figures element had been copied for the logo of Carnival celebrations in Salvador. Gelli defended the allegations, stating that the concept of figures linked in embrace was not inherently original as it was "an ancient reference" and "in the collective unconscious". Gelli cited Dance as an influence of the logo's concept, and stated that the designers had intentionally aimed to make the interpretation of the concept as dissimilar to others as possible. Suspended president Dilma Rousseff during an interview with Al Jazeera at the Alvorada Palace, 1 June 2016. On 5 October 2017, the head of the Brazilian Olympic Committee Carlos Nuzman, was arrested amid an money laundering investigation that a $2 million payment was made to secure votes for the bid to bring the Olympics to Rio. The money was allegedly paid to Lamine Diack and his son Papa Massata who was a member of the IOC at the time of the alleged payment which was three days before the vote in 2009. All 3 were charged with money laundering along with the former governor of Rio state Sergio Cabral, who was already in prison for money laundering offences at the time, Brazilian businessman Arthur Soares and ex Brazilian Olympic Committee chief Leonardo Gryner. All 6 were charged with running a criminal organisation, money laundering and violating currency laws in their own native countries. An outbreak of the mosquito-borne Zika virus in Brazil raised fears regarding its potential impact on athletes and visitors. To prevent puddles of stagnant water that allow mosquitoes to breed, organisers announced plans to perform daily inspections of Olympic venues. Zika virus transmission was also attributed to inefficient sewage treatment in the area—an issue that was also in the process of being addressed for the Games. In May 2016, a group of 150 physicians and scientists sent an open letter to the World Health Organization, calling upon them to, according to co-author Arthur Caplan, have "an open, transparent discussion of the risks of holding the Olympics as planned in Brazil". The WHO dismissed the request, stating that "cancelling or changing the location of the 2016 Olympics will not significantly alter the international spread of Zika virus", and that there was "no public health justification" for postponing them. Some athletes did not attend the Games because of the epidemic. On 2 September 2016, however, the World Health Organization reported that there were no confirmed cases of Zika among athletes or visitors during the Olympics. Fort Copacabana hosted the cycling road race (start and finish), marathon swimming and triathlon events. F-5EM Tiger II fighter jet of the Brazilian Air Force during an air intercept training for the Rio 2016. Rio's crime problems also received renewed attention after it was awarded the Games; Mayor Paes stated that the city was facing "big issues" in heightening security, but that such concerns and issues were presented to the IOC throughout the bidding process. The governor of the state of Rio de Janeiro also highlighted the fact that London faced security problems, with a terrorist attack occurring just one day after it was awarded the 2012 Summer Olympics. The estimate was that 5,000 men of the National Public Security Force and 22,000 military officers (14,800 Army; 5,900 Navy and 1,300 of the Brazilian Air Force), in addition to the fixed quota of Rio January, would act during the Olympic Games. On 21 July 2016, two weeks before the scheduled start of the Games, the Brazilian Federal Police broke up an Islamic jihadist terrorist ring by arresting 12 people. In response to these findings, WADA announced that RUSADA should be regarded as non-compliant with respect to the World Anti-Doping Code and recommended that Russia be banned from competing at the 2016 Summer Olympics. The IOC rejected the recommendation, stating that the IOC and each sport's international federation would make decisions on each athlete's individual basis. One day prior to the opening ceremony, 278 athletes were cleared to compete under the Russian flag, while 111 were removed because of doping. In contrast, the entire Kuwaiti team was banned from competing under their own flag (for a non-doping related matter). Unlike the IOC, the International Paralympic Committee voted unanimously to ban the entire Russian team from the 2016 Summer Paralympics and suspended the Russian Paralympic Committee, having found evidence that the DPM was also in operation at the 2014 Winter Paralympics. ^ The Brazilian Portuguese pronunciation is [ˈʒɔɡuz oˈlĩpikus dʒi veˈɾɐ̃w dʒi ˈdojz ˈmiw i dʒizeˈsejs], in Brazil's standard pronunciation. ^ "Olympic Athletes". Rio 2017. Archived from the original on 21 August 2016. Retrieved 21 August 2017. ^ a b "About Rio 2016 Summer Olympics". Rio 2016 Olympics Wiki. Retrieved 31 October 2015. ^ "Why Winter Olympics Bypass the Southern Hemisphere – Winter Olympics 2014". ^ "U. study: Olympic athletes in Rio dodged Zika, but not West Nile and other mosquito-borne illnesses". The Salt Lake Tribune. Retrieved 6 November 2018. ^ "Have the Olympics been worth it for Rio?". The Guardian. 21 August 2016. Retrieved 11 April 2019. For politicians and administrators who have staked their careers on these Games, there were no shortage of reasons to declare them a success: tourist numbers were reasonably high (in excess of the 500,000 target, according to the government), sales goals were reached, the infrastructure remained standing, Zika fears proved unfounded and Brazil won more medals than at any previous Games. ^ "Has the Olympics been a success for Brazil?". BBC News. 20 August 2016. Retrieved 11 April 2019. Indeed, for the second time in two years, Brazil has shown it can successfully stage a major international sporting jamboree. ^ "How do we know that Rio 2016 was a success". International Olympic Committee. 6 December 2016. Retrieved 11 April 2019. ^ "2016 Bid Process Launched" (Press release). International Olympic Committee. 16 May 2007. ^ "Four on 2016 Olympics short-list". BBC News. 4 June 2008. Retrieved 15 March 2010. ^ "The International Olympic Committee (IOC) today released the report of the Evaluation" (Press release). International Olympic Committee. 2 September 2009. Retrieved 14 February 2017. ^ "Past Bid Results". GamesBids.com. Archived from the original on 17 March 2011. Retrieved 31 October 2015. ^ "Around the Rings – Articles Archive". aroundtherings.com. Retrieved 31 October 2015. ^ "Rio 2016™ contrata Renato Ciuchini como Diretor-Executivo Comercial" (in Portuguese). Archived from the original on 4 October 2012. ^ a b c d "Sports and Venues" (PDF), Rio de Janeiro 2016 Candidate File (PDF), 2, BOC, 16 February 2009, pp. 10–11, archived from the original (PDF) on 23 May 2013, retrieved 29 June 2015. ^ "Introduction" (PDF), Rio de Janeiro 2016 Candidate File (PDF), 1, London, United Kingdom: BOC, 16 February 2009, archived from the original (PDF) on 20 March 2009, retrieved 5 May 2009. ^ Rio 2007 Pan Am Games Get Debriefed Ahead Of 2016 Bid, Toronto, Canada: GamesBids, 9 March 2008, archived from the original on 23 October 2008, retrieved 5 May 2009. ^ "An introduction to the Venues at the 2016 Rio Games". Olympic.org. Retrieved 8 August 2016. ^ a b "8,400 shuttlecocks, 250 golf carts, 54 boats... the mind-blowing numbers behind the Rio 2016 Games". Archived from the original on 7 July 2016. ^ Lewis, Peter (15 September 2013). "Rio Olympics 2016: Brazilian city in a race against time to be ready to play host to the Games". ABC News Australia. Australian Broadcasting Corporation. Retrieved 14 May 2016. ^ "Introducing Carioca Arena 1… the new home of Olympic basketball". Rio 2016. Organizing Committee of the Olympic and Paralympic Games Rio 2016. 12 January 2016. Archived from the original on 10 March 2016. Retrieved 4 March 2016. ^ "Barra Region". Portal Brasil 2016. Governo Federal do Brasil. Archived from the original on 20 August 2016. Retrieved 4 March 2016. ^ Porto Maravilha Rio de Janeiro City Hall. Retrieved 10 August 2012. (in Portuguese). ^ "Rio tram starts test running". Railway Gazette. 26 November 2015. Retrieved 1 January 2016. ^ a b "Innovative medal design unveiled for Rio 2016". IOC. Retrieved 12 August 2016. ^ a b c Busbee, Jay. "Rio mystery solved: Why don't Olympic medal winners get flowers?". Yahoo! Sports. Retrieved 12 August 2016. ^ Staff, Writer (23 May 2017). "Faster, higher, rustier: Medals from Rio Olympics damaged". Associated Press. Retrieved 24 May 2017. ^ "Greek fire lights up Rio 2016 Games... Olympic Torch lit in traditional ceremony at Olympia". Rio 2016 website. 21 April 2016. Archived from the original on 24 April 2016. Retrieved 21 April 2016. ^ "Goiás will be the first state to receive the Rio 2016 Olympic Flame". Diário Mercantil. 29 April 2015. Archived from the original on 18 April 2015. Retrieved 29 April 2015. ^ "Thousands of Olympic volunteers quit over 'long hours and lack of food'". independent. 30 December 2016. Retrieved 30 December 2016. ^ "Volunteers set to make their mark at Rio 2016". Olympic. 30 December 2016. Retrieved 30 December 2016. ^ "Prijzen tickets Olympische Spelen 2016 in Rio bekend". olympischespelenrio.nl. 16 September 2014. Archived from the original on 8 October 2014. Retrieved 6 October 2014. ^ "Olympic Games ticket prices September 2014" (PDF). Rio 2016. 16 September 2014. Archived from the original (PDF) on 27 September 2014. Retrieved 6 October 2014. ^ a b c "Brazil Made Big Environmental Promises for Its Rio Olympics. Here's Why It Won't Keep Them". The Atlantic. Retrieved 13 August 2016. ^ a b Baich, Oliver. "Funding problems hit plan to clean Rio's polluted waterways ahead of Olympics". The Guardian. Retrieved 6 May 2016. ^ "Rio has broken its promise of an environmentally-friendly Olympics". Vice News. Retrieved 13 August 2016. ^ "Here's why Olympic medalists don't get flowers at the Summer Games in Rio". Mashable. Retrieved 12 August 2016. ^ "Rio 2016 handball arena will dismantle to become four schools". Dezeen. Retrieved 13 August 2016. ^ "No Answers Yet for Rio Olympic Park Dismantling". aroundtherings.com. Retrieved 11 February 2018. ^ a b "The Rio Opening Ceremony Put Climate Change Front And Center". The Huffington Post. 6 August 2016. Retrieved 7 August 2016. ^ "Rio Olympics committee reveals opening ceremony details". China Central Television. 29 July 2015. Retrieved 11 August 2016. ^ a b Levinson King, Robin (5 August 2016). "Highlights from Rio 2016 Olympic opening ceremony". Toronto Star. Retrieved 8 August 2016. ^ "Kip Keino to receive Olympic Laurel distinction". IOC. Retrieved 15 August 2016. ^ Axon, Rachel (6 August 2016). "No introduction for Brazil's president at start of opening ceremony". USA Today. Retrieved 6 August 2016. ^ "Emanuel surpreende e oferece sua medalha de ouro para Vanderlei Cordeiro" [Emanuel surprises and offers his gold medal to Vanderlei Cordeiro] (in Portuguese). Folha Online. 1 September 2004. Retrieved 8 August 2012. ^ "Mystery Solved: Why Rio Olympics' cauldron is so tiny". Yahoo! Sports. Retrieved 6 August 2016. ^ "Vanderlei Cordeiro de Lima se eterniza como herói e ganha a medalha de ouro". O Dia. Retrieved 21 August 2016. .
^ "Golf among seven sports seeking inclusion in 2016 Games". ESPN. 25 April 2008. Retrieved 20 August 2008. ^ "Olympic Leaders Approve Golf and Rugby for 2016 Summer Games". Fox News Channel. 13 August 2009. Archived from the original on 19 September 2009. Retrieved 1 October 2009. ^ "Olympics 2016: IOC Approves Golf And Rugby Sevens To Be Included In Rio De Janeiro Games". Sky (United Kingdom). Archived from the original on 22 May 2011. Retrieved 15 March 2010. ^ "Kiteboarding to replace windsurfing at 2016 Rio Olympics". BBC News. Retrieved 10 May 2012. ^ "Windsurfing restored to Brazil 2016 Olympics". BBC News. Retrieved 14 November 2012. ^ "121st IOC Session: some much awaited decisions" Archived 2015-05-21 at the Wayback Machine. ^ "History of Rugby in the Olympics". ^ "Golf receives final approval, will be part of 2016 Olympics". ^ "Rio Olympics gets 1st qualified athletes". USA Today. Associated Press. 26 August 2014. Retrieved 26 August 2014. ^ "UCI and IOC agree qualification quotas for Rio 2016". Reuters. 7 May 2014. Retrieved 26 August 2014. ^ Anderson, Gary (2 February 2014). "Weightlifting qualification criteria for Rio 2016 approved by IOC". Inside the Games. Retrieved 26 August 2014. ^ "Strong statement by the IWF Executive Board". International Weightlifting Federation. 22 June 2016. Retrieved 4 August 2016. ^ "Olympics-Kuwait ban remains in force as ties with IOC deteriorate". Yahoo Sports. Retrieved 2 January 2016. ^ "Refugees can compete for first time in 2016 Rio Olympics, IOC head says". ESPN. 27 October 2015. Retrieved 27 October 2015. ^ "Rio 2016: Refugee team to compete at Olympics". BBC Sport. Retrieved 3 March 2016. ^ "Athletics doping: Russia provisionally suspended by IAAF". BBC Sport. Retrieved 14 November 2015. ^ "Russian whistleblower Yuliya Stepanova to compete as 'neutral athlete' in Rio". The Guardian. Retrieved 15 July 2016. ^ "Background Information to the decision of the IOC Executive Board concerning the participation of Russian athletes in the Olympic Games Rio 2016". 24 July 2016. Archived from the original on 25 July 2016. Retrieved 27 July 2016. ^ a b "National Houses". Organizing Committee of the Olympic and Paralympic Games Rio 2016. Archived from the original on 6 August 2016. Retrieved 10 August 2016. ^ "Why all the midnight madness for some Olympians?". CBC News. Retrieved 18 August 2016. ^ "Australia's Olympic swimmers can sleep easy at Rio despite late night meets thanks to recovery training". The Courier-Mail. Retrieved 18 August 2016. ^ "Greed, Passion, Lust, Betrayal, and the Olympics in Between". The New York Times. Retrieved 18 August 2016. ^ "Swimming, beach volleyball will be on late in Rio". US News & World Report. Archived from the original on 8 January 2016. Retrieved 31 October 2015. ^ "Rio 2016 Ingressos – Compre seu ingresso para as Olímpiadas". ingressos.rio2016.com (in Portuguese). Archived from the original on 24 August 2016. Retrieved 21 August 2016. ^ "Rio Olympics 2016: Spectacular closing ceremony as Olympic flag goes to Tokyo". BBC Sport. Retrieved 22 August 2016. ^ "Rio 2016: Rosa Magalhães deve comandar encerramento". Rio 2016 (in Portuguese). 19 September 2015. Retrieved 21 August 2016. ^ a b Flyvbjerg, Bent; Stewart, Allison; Budzier, Alexander (2016). The Oxford Olympics Study 2016: Cost and Cost Overrun at the Games. Oxford: Saïd Business School Working Papers (Oxford: University of Oxford). pp. 18–20. SSRN 2804554. ^ a b "Olympic Broadcasting: Inside the Chief Executive's Office". TV Technology. Retrieved 12 July 2016. ^ "Olympics in VR: NBC to Present 85 Hours of Virtual-Reality Content on Samsung Devices". Variety. Retrieved 12 July 2016. ^ "Rio Olympics: NBC Plans 4K and High Dynamic Range for Opening Ceremony Coverage". The Hollywood Reporter. Retrieved 12 July 2016. ^ "IOC reaches agreement for 2014 & 2016 broadcast rights in Brazil" (Press release). International Olympic Committee. 27 August 2009. Retrieved 14 February 2017. ^ a b "Meet the Rio 2016 Olympic and Paralympic Games mascots and help choose their names". Rio 2016. 23 November 2014. Archived from the original on 9 August 2016. Retrieved 25 July 2016. ^ Quarrell, Dan (22 July 2016). "2016 Rio Olympics: Biggest stars, dates, schedule, mascots, logo, Usain Bolt 'triple triple', Zika". Eurosport. Retrieved 30 July 2016. ^ "Rio 2016: Olympic and Paralympic mascots launched". Retrieved 24 November 2014. ^ Gordon, Aaron (17 August 2016). "Olympic Wrestling Uses Stuffed Animals for Replay Challenges". Vice Sports. Vice Media. Archived from the original on 17 August 2016. Retrieved 22 August 2016. ^ "Telluride Foundation says Brazil stole its logo for Olympics". The Denver Post. Archived from the original on 10 May 2016. Retrieved 7 May 2016. ^ Flynn, Daniel; Soto, Alonso (14 March 2016). "Record Brazil protests put Rousseff's future in doubt". Reuters. Retrieved 14 March 2016. ^ Segal, David (7 August 2015). "Petrobras Oil Scandal Leaves Brazilians Lamenting a Lost Dream". The New York Times. ^ Grandin, Greg (22 March 2016). "Millennials Are Taking to the Streets to Defend Democracy in Brazil". The Nation. Retrieved 5 June 2016. ^ "Processo de impeachment é aberto, e Dilma é afastada por até 180 dias". G1 (in Portuguese). Rede Globo. 12 May 2016. Retrieved 14 February 2017. ^ "Zika virus: Olympic venues to be inspected daily before and during Games". BBC Sport. 29 January 2016. Retrieved 30 January 2016. ^ Khazan, Olga (31 March 2016). "What Happens When There's Poop in the Water". The Atlantic. Retrieved 30 June 2016. ^ ""The Games will go ahead": Tourists have a near-zero chance of getting Zika at the Rio Olympics". Quartz. Retrieved 31 May 2016. ^ "150 experts say Olympics must be moved or postponed because of Zika". The Washington Post. Retrieved 31 May 2016. ^ "Zika crisis: WHO rejects 'move Rio Olympics' call". BBC News. Retrieved 31 May 2016. ^ "Rio 2016: Are tennis players using Zika as an excuse?". CNN. 21 July 2016. Retrieved 13 August 2016. ^ Reuters (2 August 2016). "Olympics-Golf-Zika an excuse for top ranked players, says Van Zyl". Yahoo!. Retrieved 13 August 2016. ^ "No Zika cases from Olympics, says WHO". BBC News. Retrieved 3 September 2016. ^ "Note to Olympic Sailors: Don't Fall in Rio's Water". The New York Times. Retrieved 6 May 2016. ^ Carneiro, Julia (10 January 2014). "Rio's Olympic waters blighted by heavy pollution". BBC News. Retrieved 12 January 2014. ^ "German sailor blames infections on water at Rio 2016 Olympic test event". The Guardian. 28 August 2015. Retrieved 3 January 2016. ^ "'Super bacteria' found in Rio waters where sailors and windsurfers are supposed to compete in the Olympics". The Washington Post. Retrieved 6 May 2016. ^ "USOC, athletes navigate questions swirling around Rio's contaminated water". The Washington Post. 9 March 2016. Retrieved 30 June 2016. ^ "Rio Mayor Promises Crackdown on Violence". CBS News. Associated Press. 19 October 2009. Retrieved 14 February 2017. ^ "Terroristas divulgam 'manual' para ataques nos Jogos do Rio" (in Portuguese). Terra. 20 July 2016. Retrieved 25 July 2016. ^ Jelmayer, Rogerio; Magalhaes, Luciana (25 July 2016). "Brazil Authorities Arrest 12th Suspect in Alleged Olympics Terror Plot". Wall Street Journal. Retrieved 14 February 2017. ^ "Update on the status of Russia testing" (PDF). www.wada-ama.org. ^ "MCLAREN INDEPENDENT INVESTIGATION REPORT - PART I". www.wada-ama.org. ^ "WADA Statement: Independent Investigation confirms Russian State manipulation of the doping control process". www.wada-ama.org. ^ "Exclusive: Pound confident Russian athletes will be found guilty of Sochi 2014 doping despite IOC inaction". insidethegames.biz. ^ "Doping pressure mounts on IOC at German parliament". dw.com. ^ "The IPC suspends the Russian Paralympic Committee with immediate effect". paralympic.org. Wikivoyage has a travel guide for 2016 Summer Olympics.